Here's a print advert for the (brief) UK theatrical release of THE TRANSFORMERS: THE MOVIE, released (just in time for Christmas) on 12 December 1986. 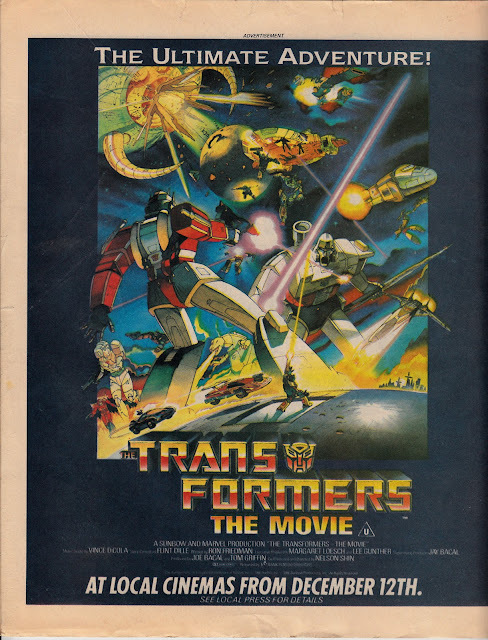 The animated extravaganza (if you were a kid), or extended toy commercial (if you were a flummoxed adult dragged to the cinema against your better judgement), had been released stateside in August, giving devoted UK fans ample opportunity to snaffle up Marvel's three-issue US adaptation (published as a one-shot special in the UK) and be the first in the playground to know the plot. Marvel UK published a one-shot tie-in Poster Magazine which also used this artwork. This advert, ironically, appeared in BATTLE ACTION FORCE (cover-dated 29 November 1986) which was, of course, largely comprised of strips based on rival toy brand ACTION FORCE (although, by this point it was well on the way to becoming a virtual clone of the US G.I. JOE range) alongside a few non-toy stragglers left over from BATTLE's glory days.